When I was a very young child, 8 years old, I remember going to services at our local Reform temple one evening. It was a very cold day, and I was running ahead of my family when my mother called out for me to be careful. I told her, secure and confident in the way that only a child can be, that I had nothing to fear since a temple is “God’s house” and of course I couldn’t get hurt there. She reiterated that I had to be careful, and that I could break a bone if I slipped and fell on the ice. That was the first time I truly began to realize that theism didn’t quite add up. I don’t remember all of the specific steps of my journey, but I do recall that by the time I was 12, I was attending a social function for my temple youth group. Part of the discussion that night was to group ourselves into four categories dealing with theism, ranging from “totally believe”, to “kinda believe but you’re not sure”, to “kinda disbelieve but you’re not sure”, to “totally disbelieve.” I was the only one sitting in the “totally disbelieve” corner. Luckily enough, Judaism is one of the few religious communities which readily accepts atheists, and I never faced any discrimination from my peer group. But I never really was comfortable with the mention of god in the liturgy, despite how much I was moved by the concept of Tikun O’lam. That was a few years before The Demon Haunted World came out. At that point in my life I was reading voraciously, and fiercely, trying to come up with some sort of overarching meta-narrative that would contextualize and define proper epistemology and ontology. I’d read everything from Thomas Hobbes to Kierkegaard (to whom I am still indebted, for his concept of a life lived authentically… even if I have taken it in a different direction than he intended). And while I was passionate, and sincere, I was rudderless. All I knew for certain is that I had no belief in any deity and the majority of the people I spoke to had very odd ideas which I could not reconcile with what I knew, for certain, about the world around me. By the time I was 15, I’d taken every science course my school offered and all the AP’s which interested me. But I still hadn’t found a systematic, coherent framework with which to analyze ideas and construct my own. Then one day, I happened to be spending my lunch period off campus, browsing the shelves at the local book store (back when local book stores were a thing). I don’t know what made me pick up The Demon Haunted world, but I cracked the pristine spine and thumbed through a few pages, and landed on The Dragon in My Garage. I was blown away. People just didn’t talk like that, think like that, make things quite that brilliantly clear. Sagan helped crystallize the tacit conclusions and vague stirrings or philosophical comprehension that had been roiling in my mind for close to half of my young life. 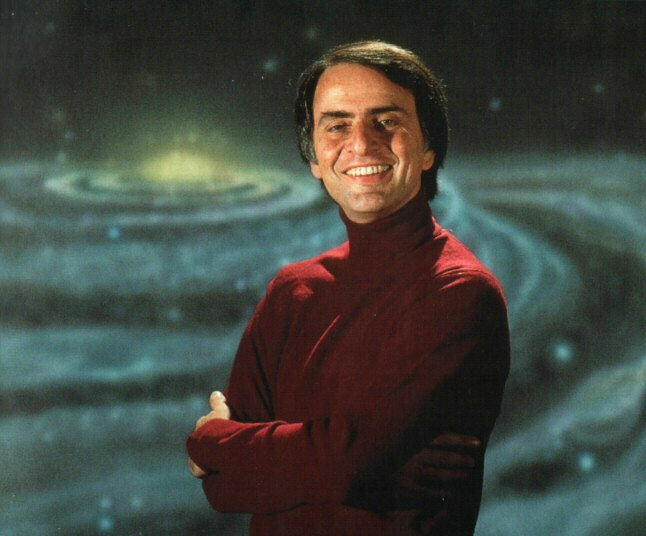 My feet were already on the path, but Carl Sagan‘s work helped me to see where I was walking to. This Post was posted in atheism, science, The Complete And Total Lack of Objective Empirical Evidence Of Deities and tagged agnostic atheism, agnosticism, Atheism, burden of proof, certainty, cognition, cosmology. Bookmark the permalink.